- Description : These Kashan carpets are hand woven according to the patterns of Persian Kashan weavers. 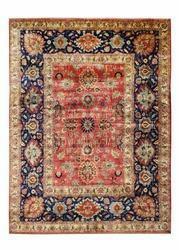 High quality wool, fine knotting, medallion & floral designs and luscious colors make these carpets charming. description : our diverse range includes something for every taste and every decorating need. PERSIAN CARPET 1288 KASHAN Q 12X60 S 10X13 WOOLRED CREAM SKU: PERSIAN CARPET 1288 KASHAN. 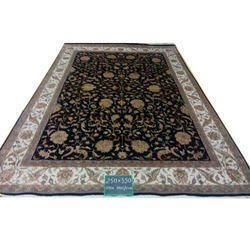 Categories: 12X60 WOOLEN CARPET, Bakhtiyar rugs, Kashan rugs. Tags: PERSIAN CARPET, Persian Carpet Woollen. all the design available like hamadan, kashan & many more. .
Hand Knotted in a traditional way with Kashan design with detailed work, the design and colors have been keenly taken care by our skilled craftsmen. This design is a kashan type design made in 14 colors, the main color of the carpet in center is red and the four corners of the carpet are blue and the border is cream.the carpet is silk pile and the wrap is cotton. This design is also available is other colors like blue center cream border, rose centre and blue border etc. The shimmering kashan designed carpet makes an impressive floor covering and has unique patterns that making it a sure choice of all. G. M. Khaja And Co. Available in different types of carpets like polyster, Nylon, Polypropylene, Production of knotted pile carpet, embroidery carpet, woven, etc.